Tori Bates' relationship with Bobby Smith is getting serious. Now that Bobby has graduated college and Tori only has one year left, it's time for the couple to start making plans. 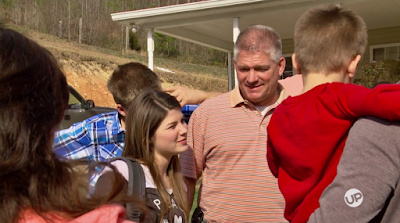 Coming up this week on Bringing Up Bates, Bobby comes to Tennessee to scope the place out and see about finding a job. I think that's so sweet but it would be nice if they also investigate moving to Florida near his family. There is no reason they all have to stay in TN. Tori is in college in Tennessee. She has one year left, so I am sure that is why he moved there. It isn't like people can't move again later. Tori has one more year at Crown College in TN. It makes sense for Bobby, who has graduated, to move where Tori has to be to finish her degree. Alyssa moved to Florida where her husband John's family lives. Michael moved to Chicago where Brandon's job is (his family lives in Michigan I believe). Maybe they will later. Since she's still in college and he can find a job anywhere, it makes more sense for him to be the one moving now if they want to be together. I got the impression that it isn't necessarily supposed to be a permanent thing (though it certainly could end up being so). It sounds though like Bobby just wants to be close to Tori while she finishes up school, so a Tennessee move seems like the best option for now. Perhaps they will consider Florida after she graduates. Congratulations Bobby on graduating college. May God guide you to a great job. Also, may God guide you both to the perfect time to wed. Bless you. its so exciting watching their relationship blossom! i have a feeling carlin isnt that far behind in the courting stage! ellie, what about trace? anything going on with him? are he & campbell 'just friends'? Aside from Tori and Carlin, no other Bates kids have announced relationships, but when the next announcement is made, we will let you know right away. I'm happy for Tori and Bobby, mainly Tori that she doesn't have to move far from her family since Bobby is willing to move to TN! Oh and also, SUCH CUTE HAIR styles on Carlin and Josie! Love that they chopped their hair. Long hair can be pretty too, I have long hair myself, but the real long hair on the Duggar girls for example is over doing it, that is just too weighty that long and not really healthy for the roots I imagine! I think since Tori has only one more year of college, and she goes to school in TN, they may stay there (in TN) for the year, then move to FL. His family is there, and Alyssa lives in FL. So it's not like she'd be alone moving to FL (if) Tori and Bobby got married. Who, IMO, would want to leave beautiful Florida to live in rural Tennessee? I live in Florida and love it. We all know that this girl isn't going to work at all after marriage, so why the pretense of finishing school first? Get married already, if you want, move to Florida and finish school. Florida is not necessarily loved by everyone. I think Tennessee is beautiful and it's admirable that Bobby is willing to move closer to her. They have plenty of time to get married- there's no rush. Florida beautiful? Really? Maybe at times by the water but anywhere else is flat as a pancake, ugly and hot. Crowded with people doesn't help matters either. I much much much would rather have my beautiful TN with lush greenery, rushing waterfalls, creeks, mountains, and with freedom to get around without waiting in traffic all the time. Oh and have to mention all the friendly people in TN. Florida has yet to attain the standard TN has with that one! But hey it's all in persons perspective! But I still think TN has Florida beat in a great place to live! If you'd ever see the area where the Bates lived, you'd never want to leave I can guarantee you! But I do agree with 3:20 pm. I lived in Florida for over forty years. I now live in Tennessee and love it. Tennessee is beautiful, and you actually get to enjoy seasons here. It is more peaceful in Tennessee and the crime isn't as bad. I would not move back to Florida for anything!